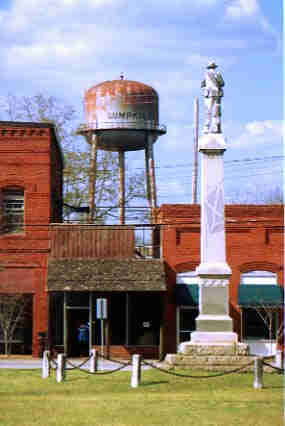 We're passing through Lumpkin, GA, a small, well-preserved Southern town. 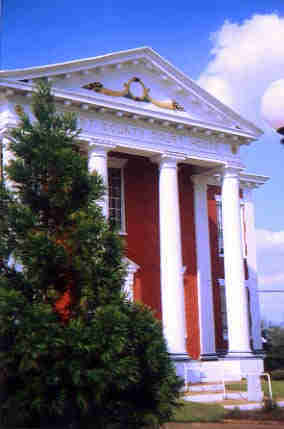 This is the Lumpkin Courthouse, centerpiece of the town square. Bedingfield Inn is located in Lumpkin, Georgia's Town Square. 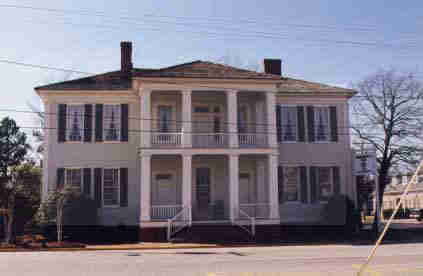 Built in 1836 by Lumpkin's first doctor, it served as a stagecoach inn when Lumpkin was a bustling frontier town. 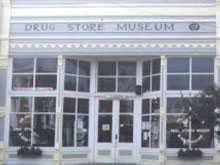 Dr. Hatchett's Drug Store Museum and Soda Fountain has one of the finest collections of genuine drug store memorabilia in the world all housed in a turn-of-the-century building. 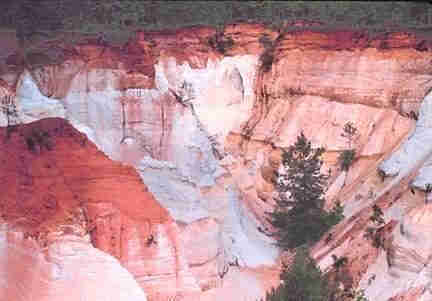 Streams have carved away iron-rich sand and clay to create this jagged terrain painted in stunning reds, ochres and whites. 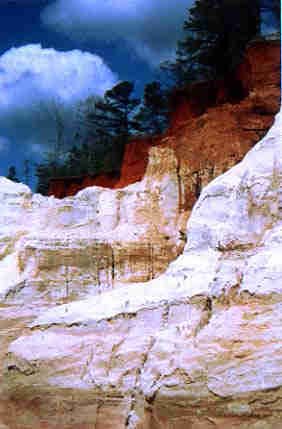 Poor farming practices in the 1800's contributed greatly to the erosion of this area. 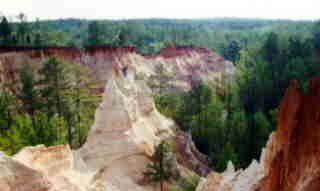 The park contains three miles of short hiking trails plus one seven-mile backcountry trail. 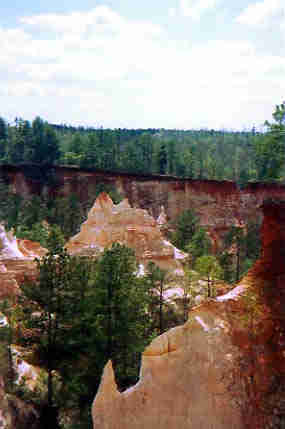 Trails lead along the top of the canyon, into the canyon and through surrounding forest. 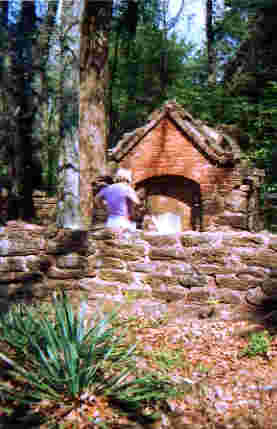 This crypt is the final resting place of Silas Ramey, a Confederate Army officer. 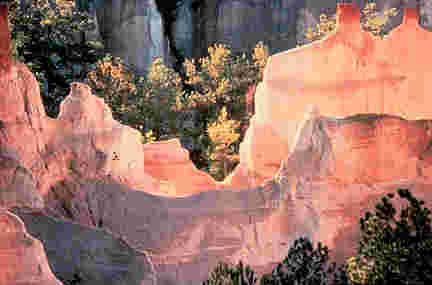 The backcountry route has six reservable primitive campsites. 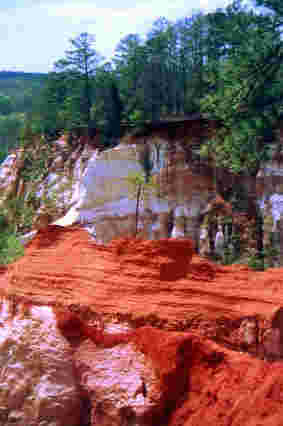 What you are seeing here is some of that famous Georgia red clay. 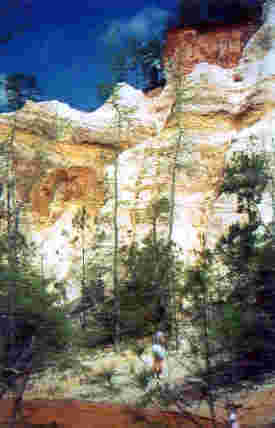 This is along the backcountry trail. 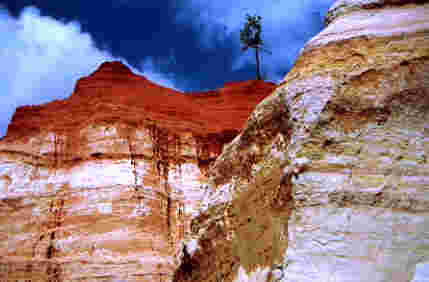 A scrub pine clings precariously to the cliffside. An interpretive center guide explains the "big ditches" to visitors. The deepest of these ditches is 150 feet. 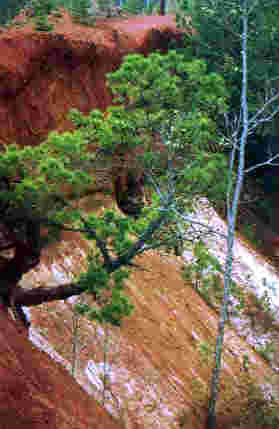 The rare Plumleaf Azalea thrives in the bottom of this canyon. 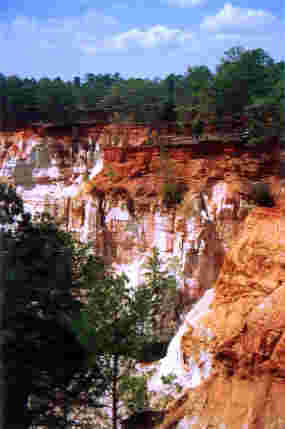 Changing sunlight alters the colors in Providence Canyon. 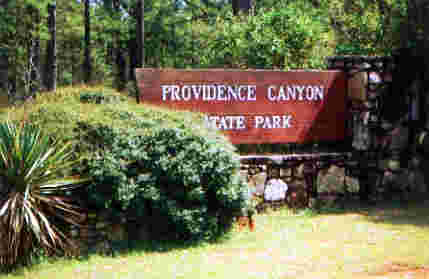 The park offers picnic shelters, and family/group shelters. Stay on the trails. Don't wander off of them. 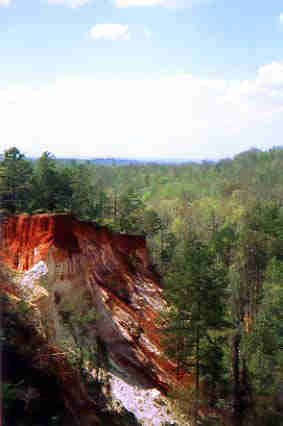 Special events held annually in the park include Wildflower Day, Amateur Photography Day and Kudzu Takeover Day. Kudzu Takeover Day? 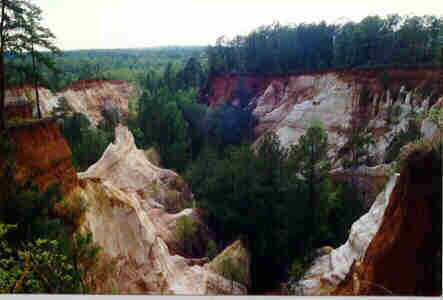 If you're not from the South, you may not know what kudzu is. It's an invasive vine capable of growing up to three feet every 24 hours. We're convinced it will take over the world some day. 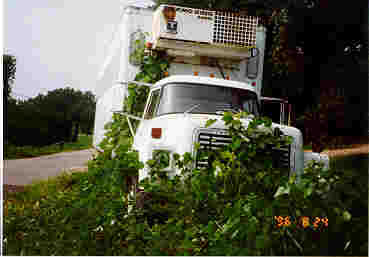 When in Georgia, you may see a sign that says: "Kudzu Crossing...No Parking." This truck driver pulled over to rest. Three hours later, he barely escaped unharmed. LOL Kudzu is a destructive vine. It drapes over trees and kills them by smothering them. Very difficult to get rid of. So, if you see those signs, you'd better take warning. 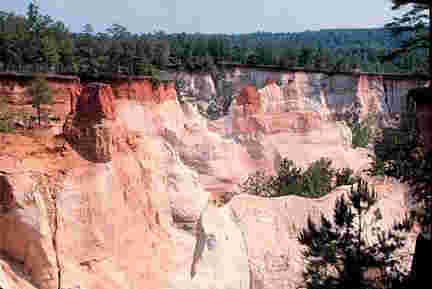 Well, we hope you've enjoyed visiting Georgia's Providence Canyon State Park. Almost felt like we were in one of our Western states, didn't it? 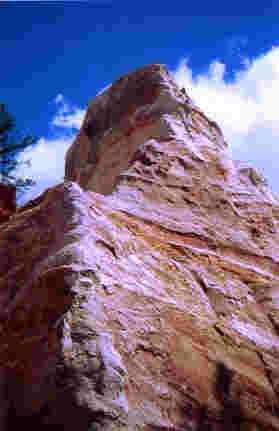 We're going to head for Stone Mountain now. Everyone ready? Let's go!